Anyone would want to be Deepak Narendran. The man is a qualified dentist, runs a successful national chain of hotels (The Central Group), and has a Ferrari and a special-edition Lamborghini in his stable. 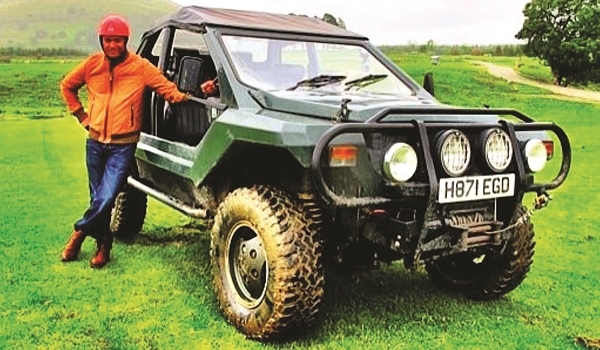 Now, the Kochi-based entrepreneurA� has his own television show, Car and Country, where he drives through the scenic countrysides of England, Scotland and Wales in luxurious super cars like the Mercedes SLS AMG, McLaren 12C and the Ferrari 458. Premiering this Sunday on Fox Life, the show documents the prowess of the machines and explores little-known towns, focussing on its people and culture. a�?You can drive super cars through any street in the world and you will not find a single person who is not awestruck. Such is the marvel of engineering that has gone into them. And to drive these machines through some of the pristine landscapes of the world is another delight,a�? begins Narendran, who will host the show with two other British television presenters, Lucia Coward and Danni Menzies. Narendran had pitched the idea to Fox Internationala��s Middle East head, Francesco Denti, last year, who immediately gave the nod. He says one of his favourite episodes is the one where he drives through the winding roads of Glencoe highlands in Scotlanda��the same roads that Daniel Craig drove his Aston Martin on, in Skyfall. In other episodes, the hosts explore the 15-century old Bamburgh Castle, try their hands at clay pigeon shooting and even bump into a Jack in the Greena�� participants in the English May Day celebrations, who dress in foliage. a�?Our filming locations are some of the best domestic tourist spots, so we meet a lot of local tourists on the show. We also travel to villages to observe the (undiluted) culture. We came across a lot of vintage cars on the show, too, as the UK has a lot of these old beauties,a�? says the 43-year-old, who is still in a daze after encountering a classic MG car in the hinterlands of Scotland. a�?We are also in discussions to film the show in France and Italy, which viewers can expect to see in the coming seasons. India, too, is at the top of our list of preferred locations,a�? he ends.